Has anyone ever asked you - What were the best days of your life? That one period of your life you always wanted to go back to? And live that life . . . one more time? When asked this, I closed my eyes and went back in my own past. And I thought . . .
. . . of the days, when lifes most complex choices had a simple solution of Akkad Bakkad Bambey Bo!
. . . of the seasons when rains were celebrated by making paper boats.
. . . of the times when waiting at the railway crossing meant counting the bogies of the train passing by. When I opened my eyes, it seems Like it Happened Yesterday! Like it was yesterday that I broke my first tooth and fell in love for the first time. Like it was yesterday, when I was about to lose my friend, and suddenly he became my best friend. I look back and it becomes a journey full of adventure. It makes me laugh, it makes me cry and I know Im here because I was . . .
Come, hold my hand, and take this trip with me. It will be yesterday for you, once again! 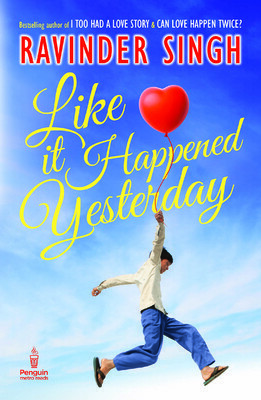 Ravinder Singh is the bestselling author of I Too Had a Love Story and Can Love Happen Twice?. Like It Happened Yesterday is his third book. After having spent most of his life in Burla, a very small town in western Orissa, Ravinder is currently based in New Delhi. He is an MBA from the renowned Indian School of Business. After working with a few Indian and multinational IT companies for more than eight years, Ravinder has finally taken up writing full-time. He loves playing snooker in his free time. He is also crazy about Punjabi music and loves dancing to its beat.